Info "Don't hit the sparks or it'll be game over!" Excitebike is one of 9-Volt's microgames in WarioWare: Twisted! It is set in the NES title of the same name. 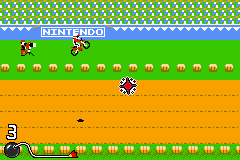 The objective is to have the Excitebiker jump over the ramp and avoid the sparks in the air. Level 1: There is one spark to avoid. Level 2: There are two sparks to avoid. Level 3: There are three sparks to avoid.